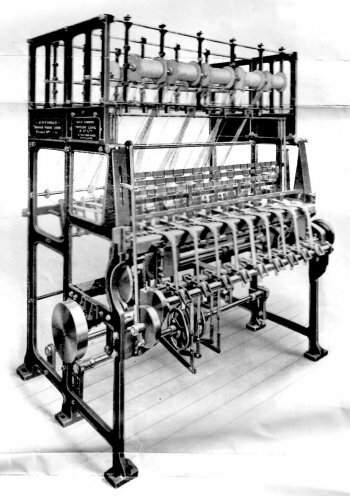 On the subject of tape weaving I ought to mention the genius and perseverance of a boyhood friend, Hubert Haywood, trained as an engineer in the textile trade, with experience in perfectionism gained by a period of employment at the Rolls-Royce works Derby and at Kynochs. The son of Joseph Haywood referred to in connection with the Poyser Loom. 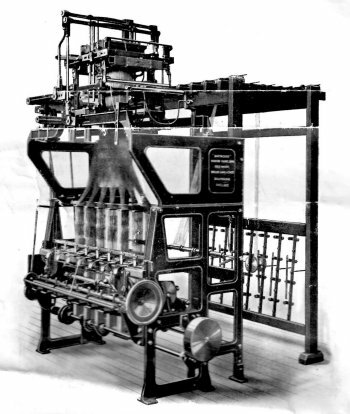 Hubert made further improvements on it, making the parts by hand in a spare room at his home over several years, working in secrecy before taking out patent rights. 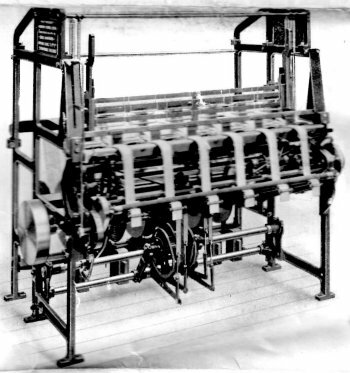 The Haywood loom could not only weave tapes but was capable of making elastics, ribbons, trimmings, galloons, petershams, webbing, gimps, gold lace, listings from silk, rayon, cotton, flax, asbestos and jute. It could be driven at high speeds from 140 to 200 picks a minute, making perfect selvedges, by shafting or electric motors. Fitted with a Jacquard the loom could weave elaborate designs. However, Hubert Haywood could not afford to exploit his invention before age and failing health intervened and eventually the provisional patents expired, so that he derived no financial benefit for the skill and inventiveness that had taken so much toll of his life. He did not live long enough to realise that his invention would be in extensive use in Europe and America as it is at the time of writing. He did derive some financial benefit from an improved mousetrap he patented and sold to a well know firm of trap makers and it is still on sale in most ironmongers' shops. As a pianist he played for the Wirksworth cinema proprietor in the evenings during the era of the silent films, his earnings helping to pay for tools and materials for his loom invention. Sole Makers: Taylor, Lang & Co Ltd, Textile Machinists, Castle Iron Works,Stalybridge. Fig 3: Haywood Loom fitted with Dobby. 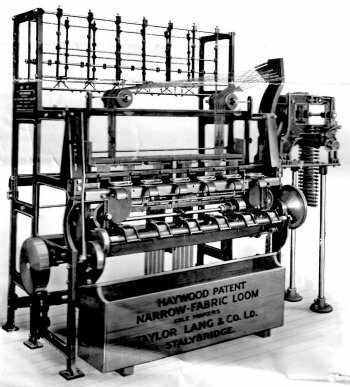 The Haywood Patent Narrow Fabric Loom has been evolved as a result of over ten years' research, owing to the admitted fact that the ordinary type of smallware loom is far from being a really satisfactory machine. 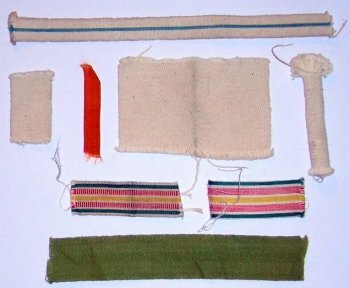 In many respects it is entirely original in design and contains a number of features which are rotected by patent, not only in England, but in all European countries and the U.S.A.
An outstanding fature of this Narrow Fabric Loom is its all-metal construction, including the shuttle. It is made in comparatively small sections each of which is a complete unit. Two, three or more sections can be coupled together and driven from a common source if so desired. For the execution of small orders the advantage of a unit with few spaces is apparant. tapes for ring spinning and ring doubling frames. changing of the warp threads is ensured even when running at high speeds. roller may be covered with abrasive or cloth or knurled upon the surface. by a slight depression of the friction lever. where floor space is not of vital importance. driven by simple connections to the standard mechanism. Ann Barsley of Rothley Leics. They had 6 children including JOHN born 1847.
three children, WILLIAM, HUBERT & LIZZIE. examples of his work with ornamental iron work around Cromford Church. SYLVIA COTTON of 6 Hillside, Scarthin, Cromford. (5)  	WILLIAM HAYWOOD b.1890 worked on the railway and married Celia ......?. Pearce of Steeple Grange, a district nurse. They had a son, Stephen. We believe that John and Barbara still live in the Wirksworth area. Last seen at a family funeral in the early 90s. Orchy Chapel and also for the weddings of cousins, Clara & Margery.